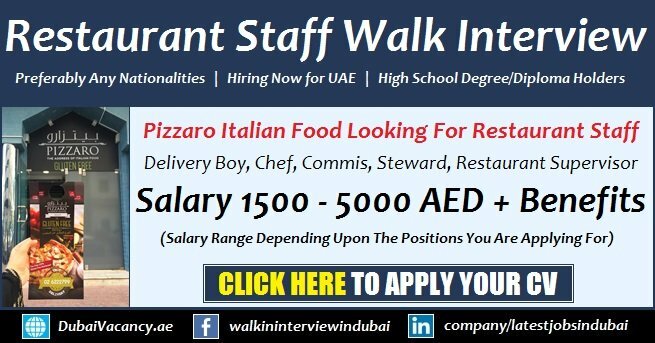 DubaiVacancy.ae platform is proud to present you new remarkable opportunities for Pizzaro UAE Restaurant Jobs Walk in Interview – QGourmet Careers. Numbers of 1 application is being offered by Pizzaro Q-Gourmet known as a well renowned Italian chain based restaurant have opened several branches throughout the UAE seeking smart, young, courteous, friendly attitude, well disciplined and well mannered restaurant Steward. Without further discussion let’s come to the point below. Candidate is required to have at least 1 to 3 years of restaurant work experience. Willing to join us immediately. How To Apply For Pizzaro UAE Restaurant Jobs? We are conducting walk in interviews tomorrow on Wednesday, 27th June 2018 and will no longer continue further after this date gone. However, those who missed this walk in interview can still forward their complete profile to the following email above. If you are the one interested and eligible candidate and having the ability to fulfill the criteria listed above then we are most welcome you to our head office and join our walk in interview there along with the necessary documents which are usually required in an interviews i.e. updated CV, educational certificate, passport copy, visa copy and experience letter (if any). Location: Pizzaro Airport Road,Shop 101, C27- Sector 14, Airport Road, Abu Dhabi. Delivery Boy, Chef, Commis and Restaurant Supervisor have been filled in the last walk in interview. Rest available is Restaurant Steward.